You are here: Home / Blogging FAQ / Should I Allow Comments in My Blog? Should I Allow Comments in My Blog? This is a common blogging question and when it comes down to it the short answer is that it is totally up to you. But there are more things to consider. 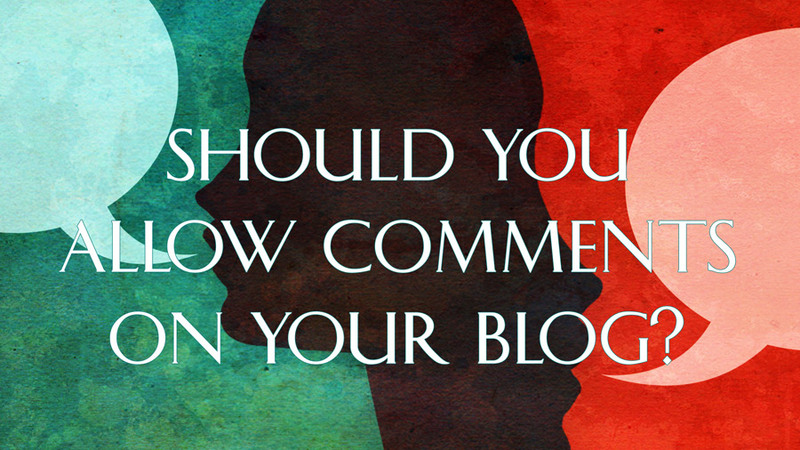 In my personal opinion, comments are an integral part of a blog and should always be allowed. Comments build community and increase engagement and they usually help improve SEO. If you decide to activate them, I certainly recommend you place some protections to make the process more manageable. If you are going to allow comments on your WordPress blog, then you should have the plugin Akismet installed and configured to help you combat comment spam. You should also be prepared to respond to comments from readers. If you are blogging for business or work, you also want to set a policy in place to deal with negative comments. Remember that you have full editorial control over any comments left on your blog, not only can you edit them, but you can just delete them as well. WordPress has a built-in comment functionality and it works great, simply visit the Discussion section under the Settings of your WordPress dashboard. If you want to allow comments from your visitors but you want to make the experience a little more sophisticated then maybe you can look at other systems to help you leverage comments. Jetpack comments allow your visitors to leave a comment by using one of their existing accounts in WordPress.com, Google, Facebook, or Twitter. If you are using the Jetpack plugin already (see: What is Jetpack? ), then you simply activate the comments module and you are ready to go. I consider this WordPress comments plus, because it ties in directly to your WordPress blog with minimum configuration. It is also developed by Automattic and thus it just works. CommentLuv is a plugin that connects to your WordPress blog and encourages other bloggers to leave comments and interact with your content. It does this by allowing them to pick a blogpost from their own blog and puts it as a link next to their comment. As the blog owner, you get to pick a lot of different options on how you want CommentLuv to work. You can get the CommentLuv plugin here: CommentLuv for WordPress. Facebook allows you integrate Facebook comments into your blog. This is a good option if you have a lot of visitors that come from Facebook and want to make it easy for them to interact with your content. You’ll notice that a lot of newspapers, and other news blogs have this comment system enabled. Facebook visitors are presented with a familiar interface to leave a comment and they don’t have to provide any more information. The downside to this is that the comments are not really part of your blog, they are just displayed under your blogpost. They may not provide any SEO benefit. There are a number of plugins to help you integrate Facebook comments. You’ll need to configure Facebook to work with your site, then integrate it with a plugin. This is one of the most popular plugins you can use: Facebook Comments. Update: The official plugin for Facebook integration has been abandoned by Facebook. This is a good sign that you should NOT use Facebook comments on your blog. Disqus provides a third party service to manage your comments. This is a “universal commenting system” because they allow the visitor to identify themselves on your blog through a number of networks. The visitor doesn’t have to fill out name, email, url and all that information, they just pick their favorite network and leave their comment. The networks available include Facebook, Twitter, Google and Disqus. Disqus requires a little bit of configuration but it’s very well documented and you can also use a plugin to get the system working with your WordPress blog. Disqus Comment System. So many options, so much to think about. I know. My advice is to open up your blog for comments and let people comment with as little friction as possible. Don’t make people register for your blog just to leave a comment. This is why Facebook and Disqus comments are so popular; most people already belong to one of those networks so it’s easy for them to speak their mind on your blog. If you want to attract other bloggers then use CommentLuv, if you have new content all the time and it is suitable for a Facebook audience then maybe Facebook comments are the way to go. If you want to keep your options open but you aren’t happy with the plain WordPress comment system then you may want to use the Jetpack comments. If Jetpack comments aren’t enough for you then step up to Disqus which provides your visitors with an easy way to sign in to leave a comment and also ties into the Disqus community which could expose your content to a whole new audience.